Led by strong performance from its UK-based subsidiary, Jaguar Land Rover (JLR), Tata Motors posted better-than-expected performance in the March quarter (Q4). Consolidated net profit after tax at Rs 4,366 crore, though 16.8 per cent lower year-on-year (y-o-y) came in better than analysts’ estimates which had pegged it at Rs 2,575 crore. While revenues at Rs 77,272 crore was down 2.8 per cent, this was lower than analysts’ expectations of Rs 78,797 crore. The company indicated that consolidated revenues were impacted by translation losses from pound to rupee of about Rs 9,032 crore. 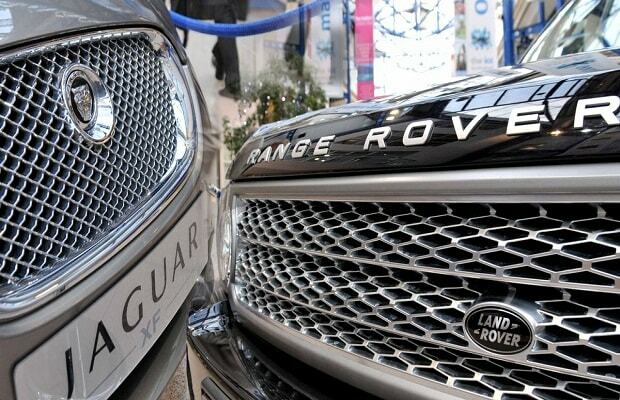 While volumes at JLR were up 13 per cent y-o-y, Indian operations saw a growth of 4.9 per cent. Q4 performance at JLR was driven by strong volumes as well as favourable geographic or regional mix. Going ahead, growth at JLR would be driven by the launch of the new Discovery and Range Rover Velar. Bharat Gianani of Sharekhan attributes the good Tata Motors show to higher JLR volumes and sequential reduction in marketing expenses. 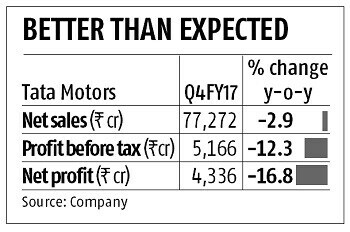 The company (JLR) indicated that they would maintain margins at the Ebit level (Q4FY17 at 9 per cent) at 8-10 per cent going ahead. FY17 was not a great year for the company’s commercial vehicles (CV) business as it lost market share of 270 basis points in M&HCVs. The company indicated product gaps, aggressive discounting and drop in demand in smaller CVs led to its market share loss in CVs. The company was hoping for a better second half for the CV space given disruptions such as transition to BS-IV over the past couple of months. It was looking at taking five per cent market share each in CVs and passenger vehicles over FY18-FY19. While passenger vehicle volumes led by Tiago were robust and Tigor and Hexa launched over the financial year, its gain in the SUV segment would be led by the Nexon, to be launched in September. On the product development side, the company was cutting its platforms from six to two and hoped to improve on its product innovation as well as technology with collaboration from Skoda and Volkswagen. On the CV side, it was targeting a 20 per cent top line contribution from exports. This comes on the back of 60,000 units of export in FY17, its highest till date. Further, it sought to launch a full range of defence solutions which, coupled with new product introductions, was expected to improve its capacity utilisation. On the cost side, the company was looking at aggregating volumes by reducing the supplier count and manpower reduction to the tune of 10-12 per cent, largely at the managerial level. The management indicated the largest cost base was direct material costs and the company was aiming at reduce it by over one per cent annually.